Musha Bushido Zetsurin Samurai Sword White | BUDK.com - Knives & Swords At The Lowest Prices! Just got this sword today. Mine is a good solid sword. No raddles. I think its a very beautiful design. Love how it fits flush with the sheath. As in the rest of the comments the throwing dagger does fit loosely in the slot but if it was hard to get out what use would a throwing dagger be if you can't use it quickly? The edge came sharp not sharp enough to cut hair but sharp enough to cut what you'd want with it. Diffenitly would suggest this sword to anyone that wants a real non-garbage pigtailed sword. Very Good Quality Sword, Only Complaints, The Little Hidden Knife Is Pretty Flimsy, And I Spent HOURS Rewrapping The Sageo (Sheath Wrapping) Again, I Got It And It Was Just Kinda Haphazardly Thrown On There, So I Finally Rewrapped It Properly. I was not to sure about this swords. But the reviews at True Swords helped me make up my mind. Now that the swords is here I do not regret it at all. This is my third sword from True Swords. 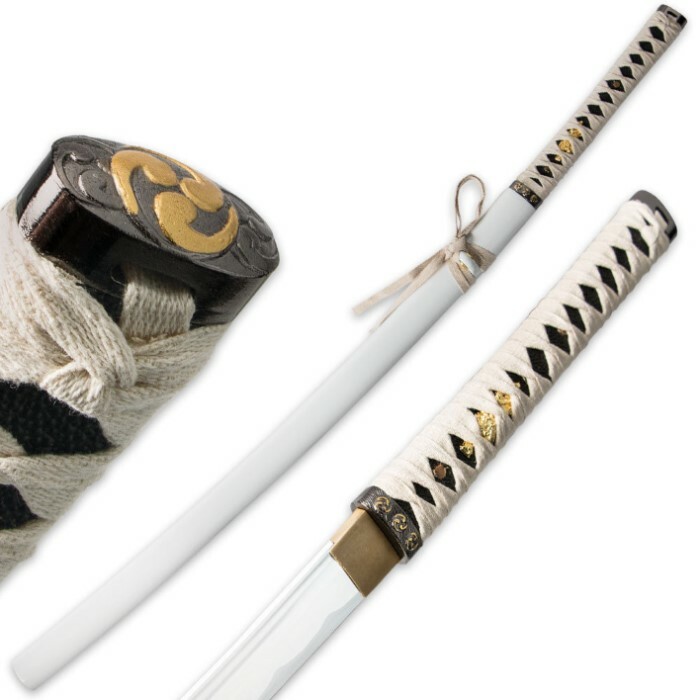 I have some $20 swords from here, but this one is my third Musashi blade from here. True Swords have never failed me yet on a great sword that is not a $20 sword. Don't get me wrong, I buy the cheap ones expecting them to be not great. That so I can experiment with them and knowing they are not going to last long, because they are not full tang or to flimsy. So True Swords is three out of three in my book when it comes to more of a swords you are willing to dish out money for. Thank you True Swords for the great service. I haven't really got my order, yet, but I feel that this site focuses a lot more on knives and novalty items then it does swords. You guys should try to get your hands on newer sword ideas. I'll give my order a review when it comes in. I would consider myself more of an advanced collector. I bought this sword because I liked the style. The idea of a hidden thrower sounded interesting so I had to find out. The handgrip/hilt is ok but decently long. The swords weight is surprisingly light compared to most of my collection. I would say it is relatively sharp not o much razor sharp a advertised however its still sharp enough to cut very well. The Scabbard was in very good shape very minimal to no scratching and amazingly light. The only real downfall with the sword was that the thrower hangs over the guard just a tad. Overall for $54.99 its a nice sword. good for a newer collector or if you like the style I mean its pretty nice. If it was actually razor sharp (could break skin with little to no effort) and if the handgrip had a little better material I would have given it five stars but like I said for $54.99 I cant complain. 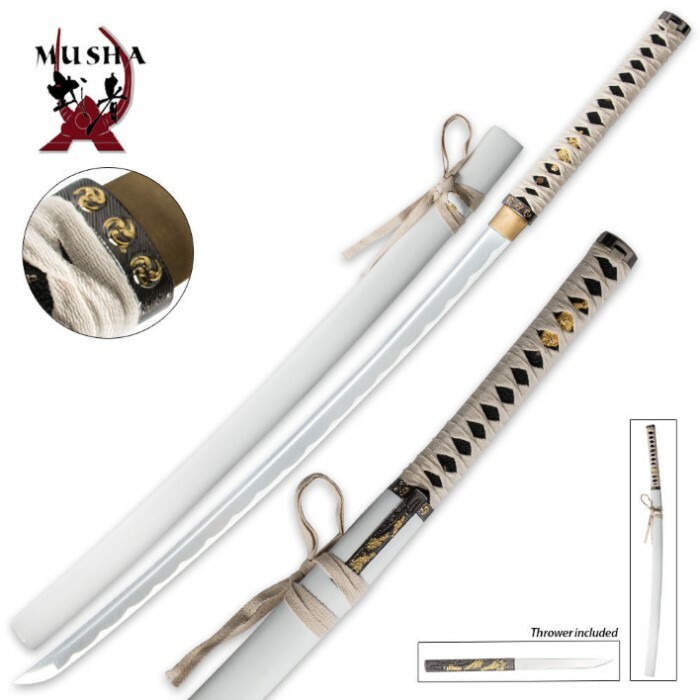 I buy a lot of products from trueswords and Musashi... And this is by far my favorite!